These shears feature long, sharply ground blades. They are used on most types of hedges, especially tightly packed hedges as used for topiary and in typical English gardens. The professional models have serrations near the bottom of the blade for gripping and cutting larger twigs and hard wood during cutting. A sign of good shears : The blades are shaped so that they are only touching at the cutting point, this reduces friction and sticking. Wavy-Blade shears feature 2 very sharp blades, ground to a distinct wavy shape. The waves trap groups of twigs and prevent them from sliding along the blade during the cut, which ensures a uniform finish to the hedge. 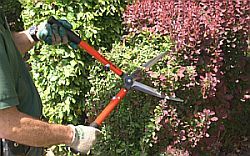 These shears are especially useful for cutting hedges and plants with a fairly open structure, like pines and vines. The waves stop the stems from sliding along the blade. Bahco Hedge Shear Universal 525mm PG-32-F Straight edge blades - rubber stoppers - metal handles Straight blades for hedge trimming. Small round steel tubes with comfortable orange handles. For light hedge trimming. Length: 52.5cm. No spare parts available.